Stockholm University (Swedish: Stockholms universitet) is a public university in Stockholm, Sweden, founded as a college in 1878, with university status since 1960. Stockholm University has two scientific fields: the natural sciences and the humanities/social sciences. With over 34,000 students at four different faculties: law, humanities, social sciences, and natural sciences, it is one of the largest universities in Scandinavia. The institution is regarded as one of the top 100 universities in the world by the Academic Ranking of World Universities (ARWU). Stockholm University was granted university status in 1960, making it the fourth oldest Swedish university. As with other public universities in Sweden, Stockholm University's mission includes teaching and research anchored in society at large. The initiative for the formation of Stockholm University was taken by the Stockholm City Council. The process was completed after a decision in December 1865 regarding the establishment of a fund and a committee to "establish a higher education institution in the capital". The nine members of the Committee were respected and prominent citizens whose work have helped the evolution of science and society. The next important step was taken in October 1869, when the Stockholm University College Association was established. Several members of the committee became members of the association - including Professor Pehr Henrik Malmsten. The association's mission was to establish a university in Stockholm and would "not be dissolved until college came into being and its future could be secured." The memorandum of the Stockholm University College were adopted in May 1877, and in the autumn semester of the following year, actual operations began. In 1878, the university college Stockholms högskola started its operations with a series of lectures on natural sciences, open to curious citizens (a tradition still upheld by yearly publicly open lectures). Notable in the university's early history is the appointment of Sofia Kovalevskaya to hold a chair in mathematics department in 1889, making her the third female professor in Europe. In 1904 the college became an official degree granting institution. In 1960, the college was granted university status, becoming Sweden's fourth state university. The university premises were situated in central Stockholm at Observatorielunden but increased enrollment resulted in a lack of space, which required the university campus to be shifted to a bigger facility. 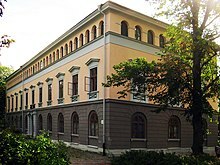 Since 1970 most of the university operations are pursued at the main campus at Frescati north of the city center, the former Experimentalfältet, previously used by the Royal Swedish Academy of Agriculture and Forestry. Stockholm University is a state agency and is governed by the decisions coming from the government and parliament. The University has the right, within the limits the government provides, to decide on many issues such as their internal organization, educational, admission of students and other administrative functions of the university. The University Board is the University's highest governing body. The board is responsible for the University as a government agency 's mission and for following the requirements of laws and regulations. The board reports to the government. It consists of eight external members (including the Chairman and Vice-Chairman), four business representatives from the university with two group alternates and three student representatives (one graduate student representative) with an alternate. The University board is above the principal who is the head of the authority and have operational responsibility for all operations. The principal has a vice president to replace him/her if necessary. At the university, there are two area councils, Area board of science and Area board of humanities, law and social sciences. They are headed by a vice principal. The area boards are responsible for strategic planning of education and research, coordination of faculty teaching, research and internal and external collaboration. After the district councils, the faculty boards are the highest decision-making bodies at the faculty level. The faculty boards consists of the dean, the assistant dean, other business representatives and student representatives. The deans are appointed by the president after proposal by choice within the faculty. After faculties, decisions are taken on the institutional level, where each department has a department head who manage and make decisions together with the institutional board. The University administration is the preparation and service organization for the University board, principals and other decision-making bodies, and it is led by the executive director. The University administration has a number of administrative units in charge of different parts of the university administration, for example, finance department, IT department, HR department and the student section. There are also three staff units: The strategy, planning and communication unit that will help the university management with decision making. The Permanent Secretary is the most senior official at Stockholm University and decide on including university administration's organization and finances. The permanent secretary is titulated University Director. Education and research at Stockholm University is carried out within the natural sciences and the humanities/social sciences. Within these fields, there are four faculties with 65 departments, institutes and centers within the humanities, law, natural sciences and social sciences. Research and training also takes place at a number of centers and institutes with a separate governing board, but that organisationally belong to a department. Stockholm University offers courses at both undergraduate and advanced level. There are 200 Bachelor's programmes, 75 master's programmes taught in English, and 1,900 courses to choose from within science, humanities, social sciences and law. Students can choose between studying one or more free standing courses, that each may last between five weeks and one semester, or apply for a full study programme. The university researchers engage in governmental investigations, participates in the media, leaving comments on proposed legislation and is included in several Nobel committees and international expert bodies. Stockholm University Marine Research center (SMF) provides "Askö Laboratory". Research on ecosystems, ecology and the impact of human interference is carried out here. The field station was built in 1961 by Professor Lars Silén, Prefect of the Department of Zoology, and is now established as a renowned marine research center. Tarfala research station belongs to the Department of Physical Geography at Stockholm University. The station is located 1135 meters above sea in Tarfaladalen, on the east side of Kebnekaise in arctic / alpine surroundings. Here, glaciological, hydrological, meteorological and climatological research is conducted. The station has the capacity to accommodate groups up to 25 people and the staff consists of 2–5 people. Tovetorp Zoological Research Station belongs to the Department of Zoology at Stockholm University, and is located about 95 km southwest of Stockholm. It conducts research and training activities in ecology and ethology. Every year Tovetorp is visited of up to 600 students who live and study between 2–10 days on the station. On the research side, over 20 people work today with different research projects. The number of employees are currently 6 people. Prior to 2008, Stockholm University had only one student union called Stockholm University Student Union (Stockholm universitets studentkår, SUS). However, since 2008 the computer and system science students and the teacher students have their own, independent, student unions called DISK and "The Teacher's College's Student Union" (Lärarhögskolans studentkår). The law students also have their own student union, as do journalism students (Studentkåren vid JMK). The future of the Teacher's College's Student Union is however not entirely safe, as Stockholm University's Student Union has declared it will begin talks with the Teacher's College's Student Union on transferring its members to it, as it already has a teacher's division. In contrast to common belief, DISK is not an abbreviation. Sara Danius, Professor in Literature, member of the Swedish Academy. Horace Engdahl, former Permanent Secretary of the Swedish Academy. Harry Flam, economist, Dean of the School of Business. Christer Fuglesang, astronaut. First Swede and Scandinavian in Space. Gunnar von Heijne, Professor at the Department of Biochemistry and Biophysics. Oskar Klein, Professor in Physics. Johan Rockström, Professor of environmental science. Ebba Witt-Brattström, Professor in Literature. Johan Stael von Holstein, Swedish entrepreneur. Carl Bildt, Prime Minister of Sweden 1991–1994, and Foreign Minister 2006–2014. Thomas Bodström, former Swedish Minister of Justice. Dag Hammarskjöld (Doctorate in Economics 1933), U.N. Secretary General. Karin Kock-Lindberg, first woman to hold a Ministerial position in Sweden, and first female professor of national economy in Sweden. Princess Madeleine of Sweden, studied Art History and Ethnology. Carolina Neurath, Swedish journalist and writer. Barbro Osher, diplomat and philanthropist. Olof Palme, Prime Minister of Sweden. Andreas Papandreou, Greek prime minister. Taught at the university 1968–1969. Georgios Papandreou, Greek prime minister. Studied sociology 1972–1973. Fredrik Reinfeldt, Prime Minister of Sweden 2006–2014. Victoria, Crown Princess of Sweden studied Political Science. Signe Hammarsten-Jansson (1882–1970), Class of 1905 - Swedish illustrator. Jens Lapidus, criminal defense lawyer and author. In the Academic Ranking of World Universities 2017, an annual publication of university rankings by Shanghai Ranking Consultancy/Academic Ranking of World Universities, Stockholm University was placed as the 74th overall best university worldwide. The Times Higher Education (THE) World University Rankings 2018 listed Stockholm University at position 134 on the list of the world’s top universities. Times Higher Education World University Rankings are annual university rankings published by British Times Higher Education (THE) magazine. In the QS World University Rankings, Stockholm University was ranked 200 overall in the world in 2018. Its subject rankings were: 107th in Arts & Humanities, 235th in Life Sciences & Medicine, 261st in Engineering and Technology, 150th in Natural Sciences, and 65th in Social Sciences and Management. In the CWTS Leiden Ranking 2014, Stockholm University was placed at 140 on the list of universities in the world. The main part of Stockholm University is in the area Frescati, ranging from Bergius Botanical Garden in the north to Sveaplan in the south. It is located in the world's first national urban park and the area is characterized by nature, architecture and modern art, fearuring such notable buildings as the Aula Magna (auditorium). Within Frescati, the areas Albano (Stockholm), Bergius Botanical Garden, Frescati Backe, Frescati Hage, Kräftriket, Lilla Frescati and Sveaplan are located. Identification of many of these areas have a history dating back to the late 1700s. After Gustav III's trip to Italy in 1783–84, several places at Brunnsviken were named after Italian models. Stockholm University has also, for example the Department of computer and systems sciences, a campus located in Kista. There are many ways to get to Stockholm University. The main campus Frescati is located near the underground railway station Universitetet metro station, on the red line of the Stockholm Metro. The commuter train line Roslagsbanan also stop close to the main campus, at Universitetet railway station. SL buses 40, 70, 540, 608 and 670 can also be used to get to the campus. The Computer Science campus, Kista, also is close to an underground station called Kista. It is also located close to the pendeltåg station Helenelund, only one or two stops (depending on bus line) from the bus station Torsnäsgatan located next to the campus area. ^ a b "The University in Figures - Stockholm University". www.su.se. Retrieved 31 March 2018. ^ "The University in Figures - Stockholm University". www.su.se. Retrieved 31 March 2018. ^ "Högskolelag (1992:1434)". www.notisum.se. Retrieved 31 March 2018. ^ "Departments - Stockholm University". www.su.se. Retrieved 31 March 2018. ^ "Bachelor's Programmes - Stockholm University". www.su.se. Retrieved 31 March 2018. ^ "Tarfala Research Station - Stockholm University". www.su.se. Retrieved 31 March 2018. ^ "Styrelsen – Studentkåren DISK". disk.su.se. Retrieved 31 March 2018. ^ "Karin Kock". Kvinnor i arbete (in Swedish). Gothenburg University. Retrieved 21 November 2011. ^ "ARWU World University Rankings 2017 - Academic Ranking of World Universities 2017 - Top 500 universities - Shanghai Ranking - 2017". www.shanghairanking.com. Retrieved 31 March 2018. ^ "QS World University Rankings 2019". topuniversities.com. 6 August 2018. Retrieved 6 August 2018. ^ "World University Rankings". timeshighereducation.com. 6 August 2018. Retrieved 6 August 2018. ^ "World University Rankings". timeshighereducation.co.uk. 6 August 2018. Retrieved 6 August 2018. ^ "Stockholm University Rankings". topuniversities.com. Retrieved 6 August 2018. ^ (CWTS), Centre for Science and Technology Studies. "CWTS Leiden Ranking". CWTS Leiden Ranking. Retrieved 31 March 2018. Wikimedia Commons has media related to Stockholm University. This page was last edited on 3 February 2019, at 16:30 (UTC).